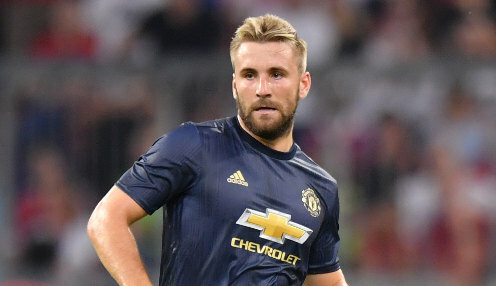 Left-back Luke Shaw is looking forward to furthering his development after signing a new five-year contract with Manchester United. The 23-year-old, who has won eight caps for England to date, moved to Old Trafford in the summer of 2014, joining for an undisclosed fee from Southampton. I'm still very young with a lot more to learn. He has since struggled to make the progress expected, having seen his time with United badly disrupted by a double leg fracture suffered in a Champions League clash with PSV Eindhoven in September 2015. However, in recent times he has become a regular first choice for the Red Devils and scored his first goal for the club in their 2-1 win at Leicester City in the first game of the new season. Shaw told the club's official website: "Since I came to United, it's been a whirlwind four years that have passed so quickly. I am very proud to sign my new contract and continue my stay at this club. "I want to let everyone (that has helped me) know that I will give everything I have to repay them and deliver success over the years to come. "I'm still very young with a lot more to learn and I can't wait to continue my progress under Jose Mourinho." Next up for Shaw and United is a major Premier League showdown with Chelsea at Stamford Bridge on Saturday, with the Red Devils having not won at that venue in eight visits since October 2012. United can be backed at 5.00 to win on Saturday and are 17.00 to triumph by a 1-0 scoreline, with Romelu Lukaku 2.75 to score at any time against his former club.